FoIP faxing, or faxing over an IP network is fully supported by CopiaFacts. You can send and receive faxes over your VoIP network and Copia solutions work in conjunction with all standard VoIP PBX from vendors such as Cisco, Asterisk, Alcatel-Lucent, Quintum, Avaya, ShoreTel and many more. 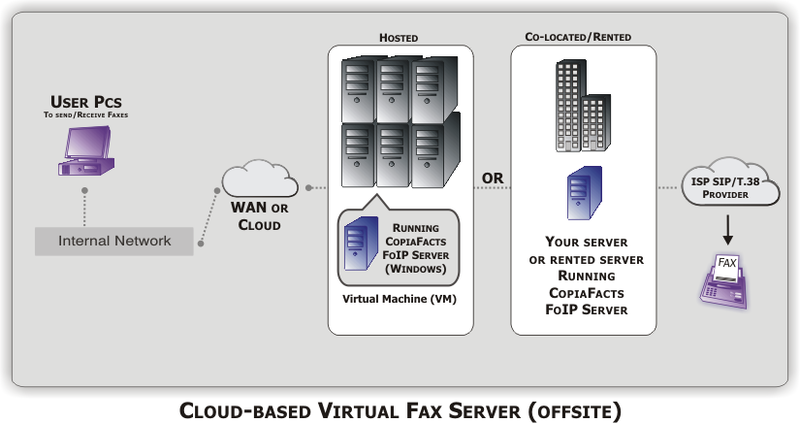 Even if you don't currently use a VoIP phone system, Copia can virtualize your faxing infrastructure. CopiaFacts supports FoIP with no in-computer hardware (often referred to as "boardless") , hosted and co-located solutions and even the use of virtual machines at your popular hosting provider. Everything FoIP starts with the SIP protocol. As the name would imply, Voice over IP (VoIP) networks are designed specifically for voice conversations. As such, most VoIP networks implement compression protocols that are tuned to voice, rather than to data (faxing is actually data transmission). For example, G.711 is commonly used for voice calls due to its high sampling rate and call clarity. Sometimes attempting to fax over a G.729/G.711 network, commonly called G.711 passthrough, is unreliable. Calls often fail with no clear reason, resulting in multiple resend attempts. This is due to the fact that faxing is a real-time synchronous operation that, unlike traditional packet-based IP traffic, requires continuous handshake and verification of data packets with very tight timing tolerances. Latency, jitter, and out of order or dropped packets are just a few of the problems that occur frequently in traditional VoIP networks and are the enemies of fax sessions on IP networks. The solution is the ITU standard T.38 protocol. T.38 accounts for timing and jitter issues encountered due to network congestion by spoofing the connection and allowing data transmissions to queue and catch-up on either side of the call. Additionally, T.38 reduces the bandwidth needed to send faxes over an IP network and supports redundancy so missing/dropped/out-of-order are recovered and available. There are many network configurations that support a T.38 FoIP implementation. CopiaFacts is flexible enough to fit into whatever environment makes the most sense for your company. Here are a few sample network scenarios to illustrate how a CopiaFacts virtual solution integrates into your infrastructure. A CopiaFacts system runs on your local network (this system can be a virtual machine or a dedicated machine) The CopiaFacts server is configured with virtual ports (no hardware) using BladeWare software. 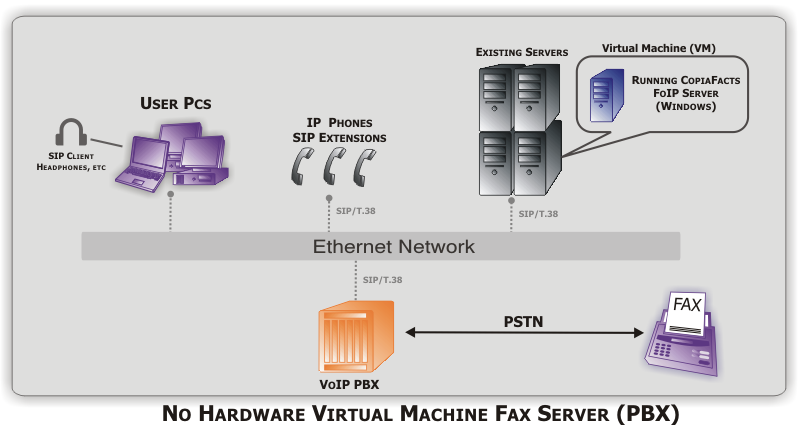 All faxes are considered to be on the "extension side" of the PBX, much like a traditional analog fax server. This uses a digital SIP/T.38 connection so DNIS (DID) and CallerID (ANI) are available on both inbound and outbound faxes. Perfect for direct fax-to-email or routing into specific applications. Purpose: You can separate fax traffic from your internal VoIP/ PBX network and use a cloud SIP provider for low cost calls. The CopiaFacts server is configured to use a ISP directly for a SIP/T.38 session. All faxes are sent directly to the SIP provider. This is a digital SIP/T.38 connection so DNIS (DID) and CallerID (ANI) are available on both inbound and outbound faxes. Purpose: You want a complete fax solution off-site, either virtualized or co-located in a secure location. A CopiaFacts system runs either in a virtualized environment or on a system located in a co-location environment. There are many providers we support and Copia also offers co-location and rental services. The CopiaFacts server instance is configured with virtual ports (i.e. no hardware) using BladeWare software. Contact Copia for the latest list of supported SIP carriers.